B.C. 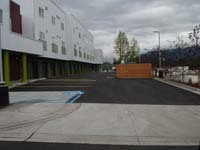 Excavating teamed with Boslough Construction to build a mixed use residential/commercial building for Cook Inlet Housing Authority. For the utility installation B.C. 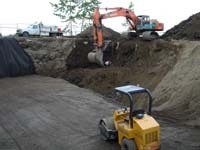 Excavating utilized two of its Vactor trucks along with its caisson and specialty trench shoring technology to surgically locate and connect to a water mainline running down a main street in Anchorage. The work was required to be performed over the weekend and at night so that a full shut down of the four-lane street could be accomplished. 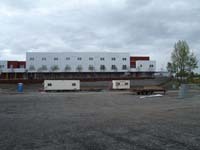 The site itself proved to be a challenge in its own right. 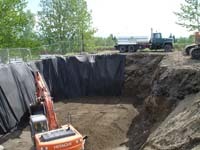 As site excavation proceeded, it became immediately apparent that the site had in the past been utilized as an asphalt disposal pit with areas of densely compacted asphalt ranging from 5-20+ feet thick. B.C. 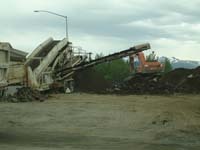 Excavating set up an onsite screening plant, screened the asphalt and disposed of it off site. 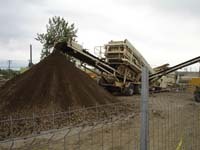 The large volume of asphalt exported from the site left the client facing a huge potential cost in replacement structural gravel. Through value engineering, B.C. Excavating and the clients came up with a plan to mine an area of the site that did not require structural gravel to help off-set the costs. 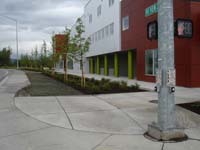 The project also required the reconstruction and updating of Park Street which included new traffic loops, sidewalks, retaining walls and signage.